Coxy, Collecting shells is looking great you can see where the BABS will make it pop, I think we'll both make our June targets. 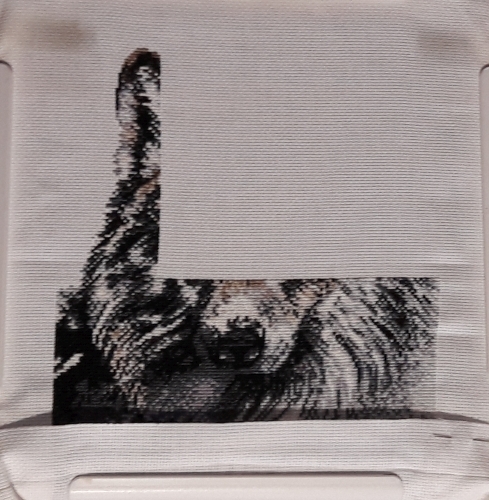 I've completed over half of Wild Wolf now the smaller face and ears section, shouldn't take long I hope. 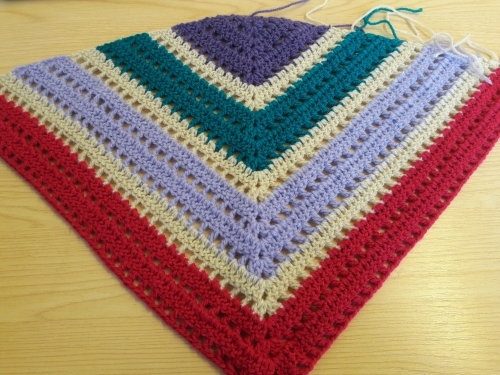 Our K&N group is still going well no new members yet but its early days, i'll take a photo of the shawl next week. 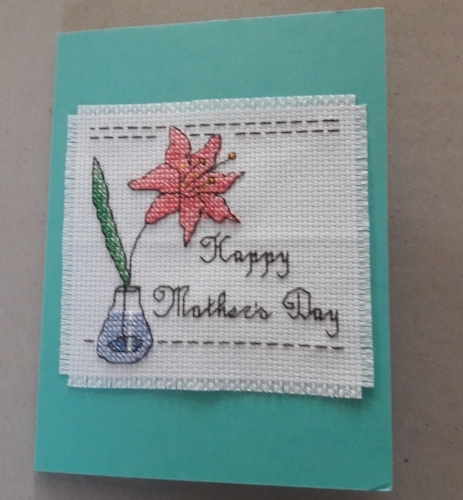 Here's the update on WW and the Mothers Day Card I sent, going to do a crochet flower card for my mums birthday. 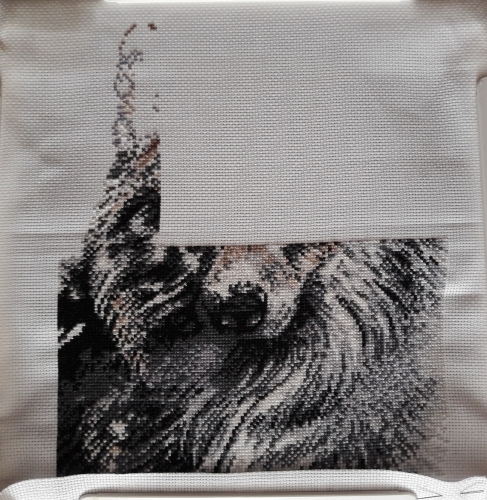 Managed an hour or so on my cross stitch yesterday after blitzing the house. I did some 'life admin' on Friday night accompanied by some good red wine. I have been volunteering for around 10 years with a particular organisation and due to a couple of annoying incidents in the last few weeks, I've decided that I'm better off stopping. A shame, but my time is very precious and when you feel undermined and unappreciated it's time to go. On the plus side, I will have more time to stitch, so bonus! As part of that, I have cancelled craft group going forward and had some chocolate (stuff Lent). Oh coxy, i'm sorry you have stopped volunteering and your craft group but you must do what's best for you, at least more stitching time is a bouns. I hope you can make or join a new group. 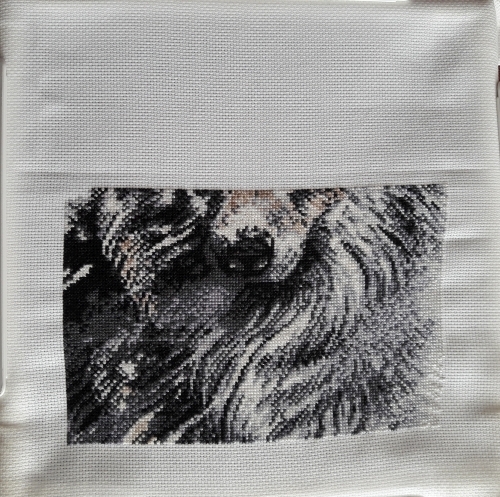 Latest Wild Wolf update, not done much as my dog has been poorly since Friday. Knit & Natter today, i'm exhausted but I really need to get out for a couple of hours, i'll remember to take a photo this time. Glorious sunny day here, but a bit of a frost. DD has a job at a local garden centre for the Summer, so I'll take her around 930am. Busy week, but I did manage some stitching - all the sand/Shells below the little girl are now done. I'm now working my way up the right hand side to finish that section off. After that it will be blues and greens for the sea at the top of the design. I can definitely see the end in sight now. I've taken a pic on my phone but Flickr playing silly beggars so will hopefully upload later. Hope poorly pooch is on the mend nmm and that you managed to get to knitting group this week. I'm hoping to spend a little time in the garden today, then do the ironing for the week. Hope to stitch tonight all being well. Sunshine here too, had it all week which is unheard of in the Lake district, haha. I did go to my K&N group but I was the only who turned up this week so I came home early. Dog is on the mend she has Epilepsy and its been a tough week finally caught up on some sleep and did a bit of stitching yesterday. Sorry to hear about pooch's epilepsy. Our dog had it too. We adopted him at 2.5 years old and six months later he had his first (to us) fit, which was very distressing. Vet gave us tablets for him, which he wouldn't swallow, kept spitting them out - even in smelly cheese chunks. In the end we resorted to grinding them and sprinkling them on his food, but he would realise and only pick. Gave up in the end. We just made sure he was hydrated and didn't over heat. The fits continued - 2 a year maybe - but he was 14.5 when we had him pts last September, so not bad all things considered. Sorry, that turned into a bit of a ramble....! Fat club tonight as I can't go on Thursday (out for dinner). Hoping to pick up my stitching tomorrow again and find the fault!! I wish my dog only had 2 seizures a year, she's had them since birth, she's 7 now, she had 6 on the Saturday then none on Sunday so thought they finished but had another 7 on the Monday, it takes her a couple of days to recover fully. Thankfully we have no problems giving her tablets she just scoffs them down, same when I tried cbd oil, golden paste and all manner of herbal remedies. That will keep you busy Elise got any photos? the world map is cute I hadn't heard of Caterpillar Cross stitch before, some cute stuff on there. MrsM-P - the stocking is gorgeous - a lovely heirloom for your GD. JCS1 - love the cat design - so good. The feathers are looking fab too and I'm loving the new fish design. Elise - only 6 WIPs The world map is fab - I think I've heard of that store before because I was looking at needle keepers. Nothing beats the Poldark one that JCS has tho....!! DH and I are tidying up the garage this evening (living the dream) as we did a big tip run yesterday and need to sort out a few things. Won't take too long but doubt I'll have the energy to stitch. With any luck(!) he will meet the pub boys tomorrow so I'll be able to find the error and put it right or at least try.... The clock is ticking to get this piece finished by the end of June. We are away in Rome next week for three nights and I won't be able to take it with me!! Haha yeah ambitious! I can't add photos for some reasons but found these of adventure awaits from someone else. Its the same pattern. All these projects will probably take me to the end of the year! Just about to start the next one...... hope everyone is going ok?